The compact wireless printer for high-quality, long-lasting photos. Quickly share that special moment - at family gatherings, parties and more - with the compact, portable PictureMate PM-400 wireless photo printer. 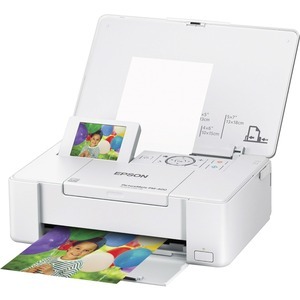 This lightweight printer delivers beautiful borderless 4" x 6" and 5" x 7" photos. Featuring wireless printing, plus Wi-Fi Direct®, it prints from your iPad®, iPhone®, tablet or smartphone. Use the 2.7" color display to preview photos. The PM-400 prints 4" x 6" photos in as fast as 36 seconds. Get stacks of photos with convenient Print Packs (includes ink cartridge and 100 sheets of 4" x 6" photo paper). Photos are smudge, scratch, water and fade resistant and last up to 200 years.